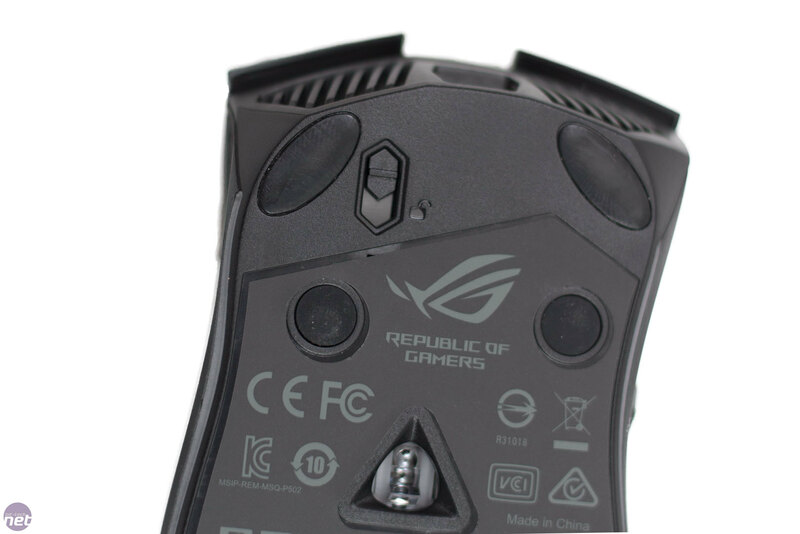 It seems Asus is on a roll at the moment. We have been getting a lot of products coming through our doors, and reviews have been generally positive. The latest product to arrive is the Asus ROG Gladius II mouse. 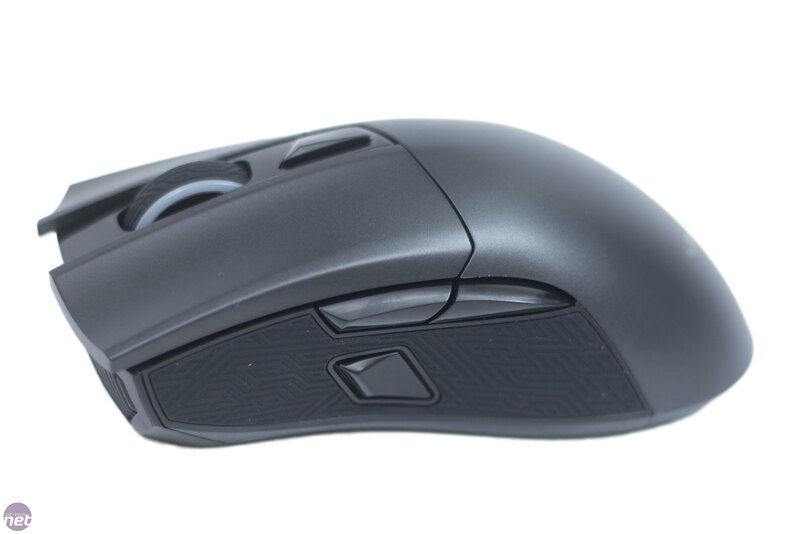 If you are a long-time bit-tech reader, you may think you have seen this mouse already. We took a look at the original Gladius in 2014; this is the new and improved version. 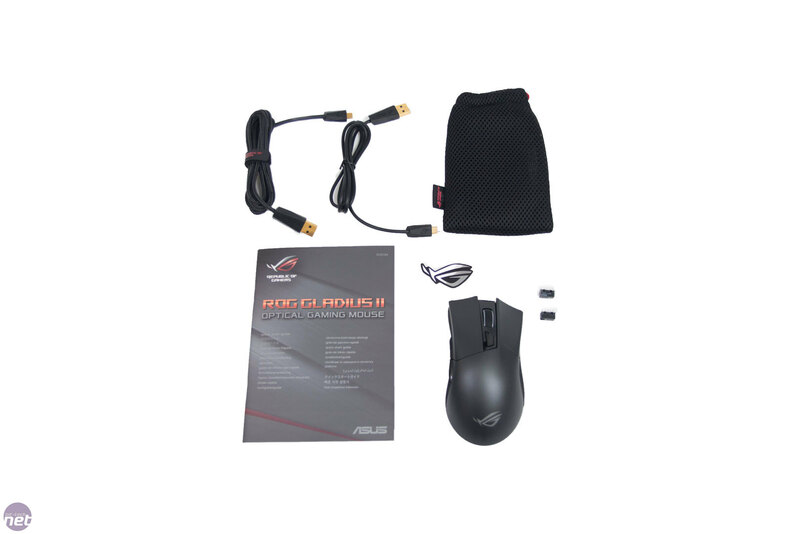 Inside the packaging, there is the mouse, two cables, a metal ROG logo sticker, two spare Omron switches, and, of course, the user manual. We are big fans of little pouches being included with peripherals. As attendees of events such as LANs, we often take our expensive gaming equipment with us, and the addition of a cheap protective pouch ensures that products are a little more protected in transit. When mice have detachable cables, it is always nice to see a couple of different ones included. 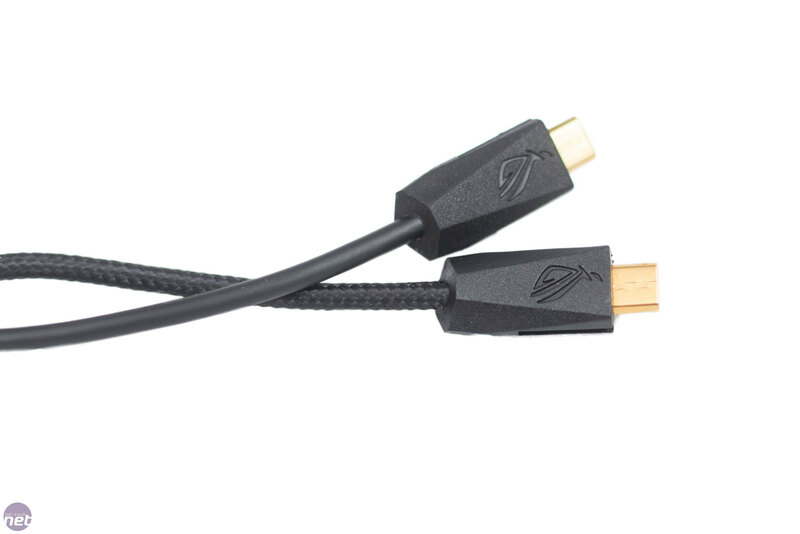 Asus has included a two-metre braided cable and a one-metre regular unbraided one. I prefer a braided cable, but I know others like unbraided. as it has less chance to snag. Either way with the ROG Gladius II, you are covered. 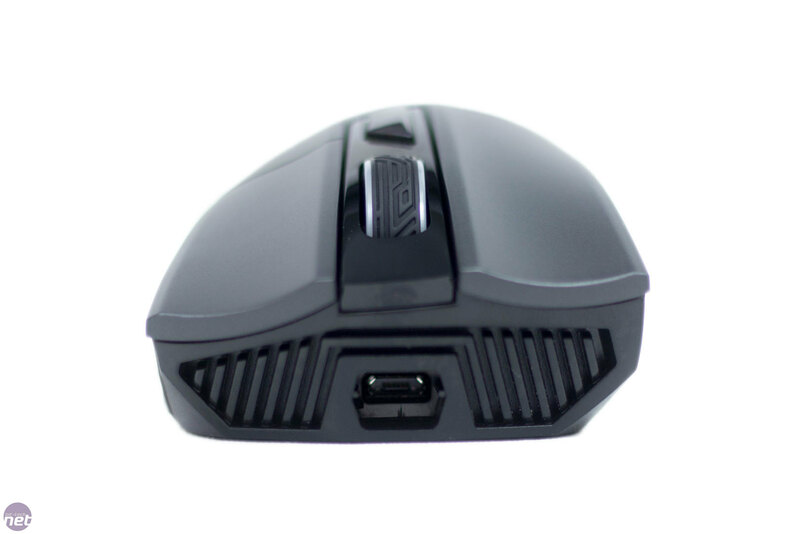 The cables are simple micro-USB cables, but you will be hard-pressed to manage to fit other cables into the mouse due to the shape and style of the rubber surround. The cable pushes into the front centre of the mouse and locks into place. 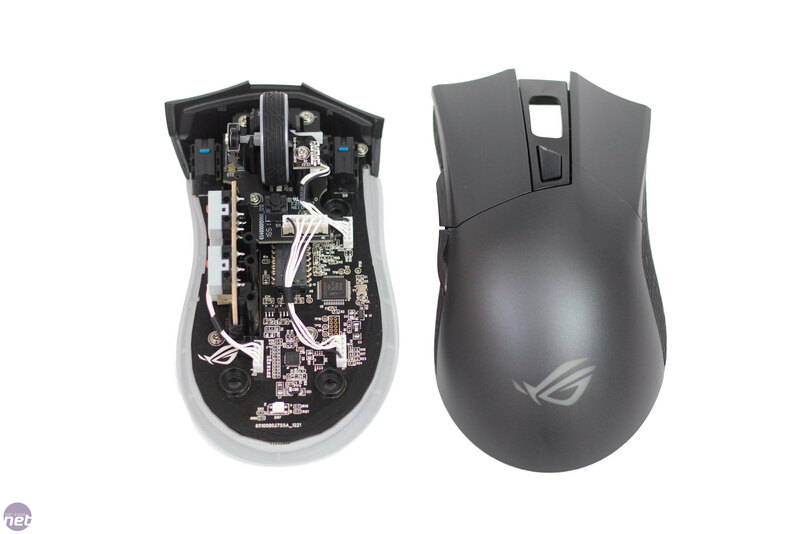 It is nice to see a mouse where the cable actually protrudes from the centre. 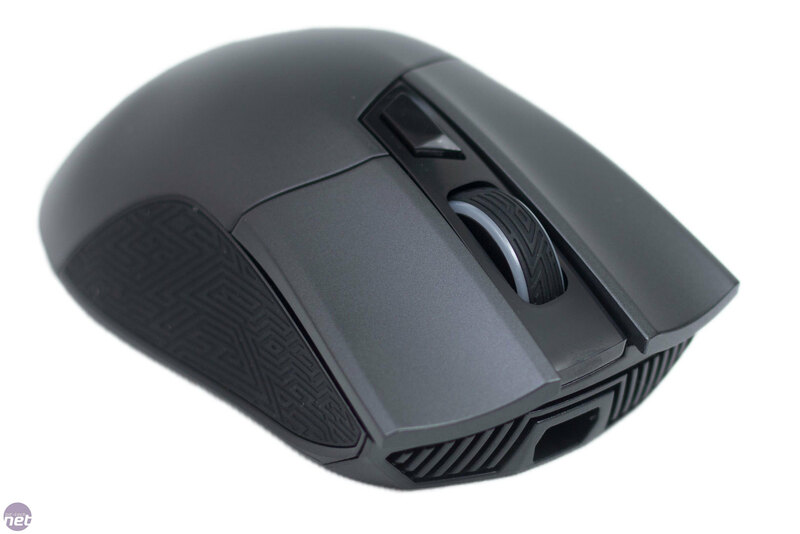 Recently, it seems manufacturers have a habit of moving the cable off-centre, which is fine if you have time to get used to it, but as someone who uses different mice every few weeks, it can get tiresome! Underneath the mouse, there is a small unlock slider., which allows you to pull the cable out. As you can see, along with the skates, there are some rubber grommets. We will show what these are for shortly. As far as the shape goes, it's very similar to the original Gladius. It is very much a right-hand oriented mouse. 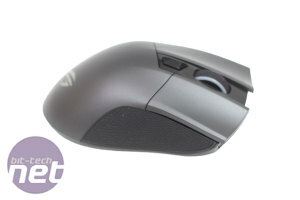 As mice are very subjective, it is always hard to comment on comfort, but to me this is a very good shape. I use palm grip usually, and the Gladius II fills my hand nicely whilst keeping it from getting too tired. Claw and fingertip grip seem perfectly fine also. Given how subjective this is, though, always try mice before you buy. 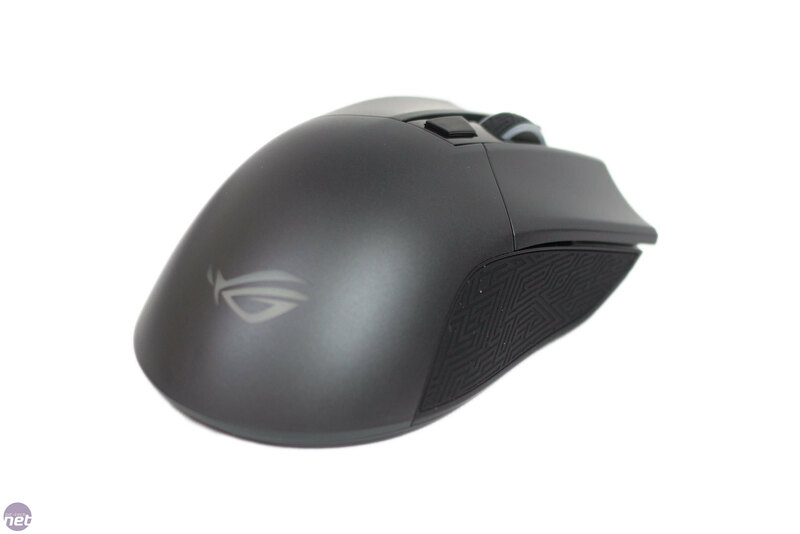 Up front, we have nice scroll wheel. 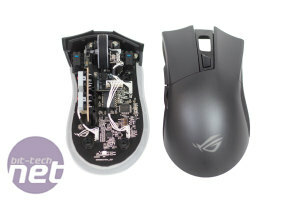 The outer edges form one of the three RGB lighting zones, and you can see the so-called Mayan pattern has been implemented here like with many of other Asus peripherals. Just behind the scroll wheel is a programmable button. By default, this controls the DPI, but you can set it to do many other things. Three thumb buttons adorn the side, and this is yet another change from the original Gladius as the first one only had two. 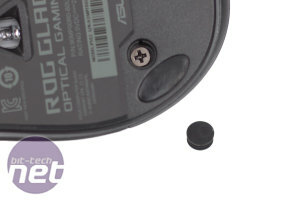 The extra button is a sniper button, which reduces the DPI until it released, allowing you to get a more accurate shot - it can be especially useful in FPS titles. 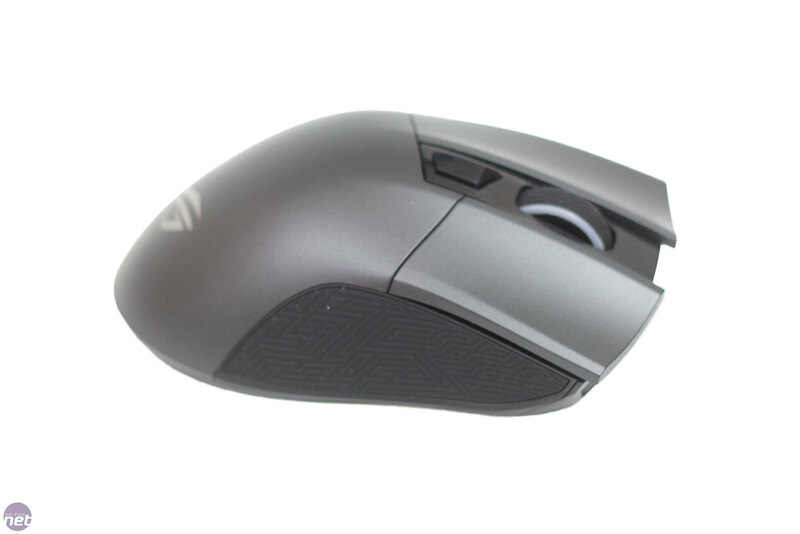 Other mice have this, such as the Corsair M65 Pro, but I personally have never been able to use it to great effect. I do have friends who swear by being able to change DPI to take shots though. The shape of the button is very nice, and it allows people with smaller thumbs to be able to reach it whilst making it still comfortable for big hands. Again, we can see the Mayan pattern imprinted into a nice rubber pad. 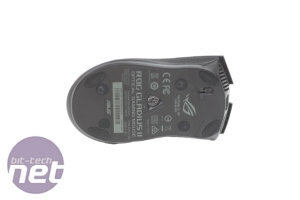 This gives the mouse a nice, comfortable grip. 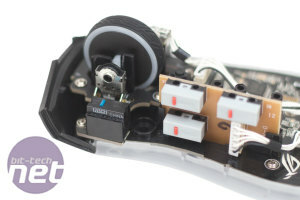 The mouse comes with Omron D2FC-F-K(50M) switches pre-installed, but there are two D2F-01F spares in the box. These switches are very similar but do have slightly different properties. The 'C' after the D2F in the name of the installed switches they are Chinese-made Omron switches, while the spares are Japanese switches which will have a far lower click rating but are usually far better quality. We will go over the feel of the switches later. Another difference between the Gladius and the Gladius II is the sensor. This time Asus has gone with the excellent Pixart PMW 3360. It is a fantastic sensor, and it is great to see it appear here. 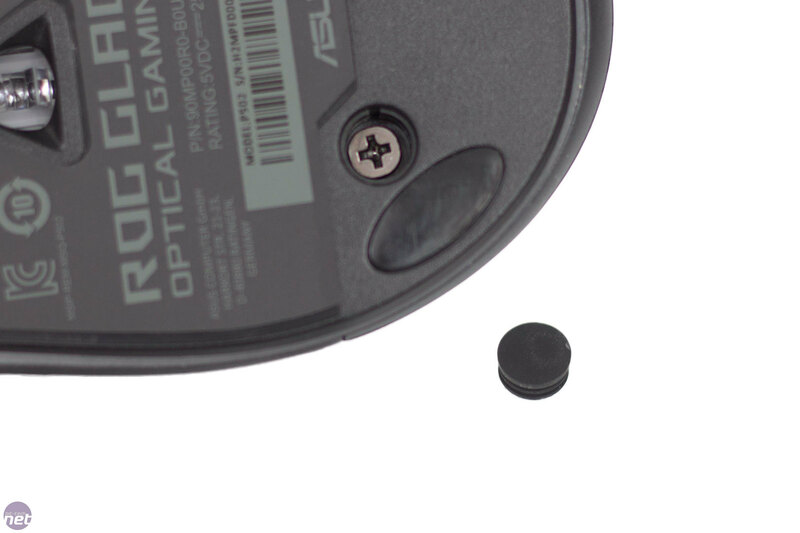 While we are looking at the bottom of the mouse, you can see four little rubber grommets. To change the switches these need to be removed. Using a Philips screwdriver, you can undo the 4 screws and pop off the fascia. 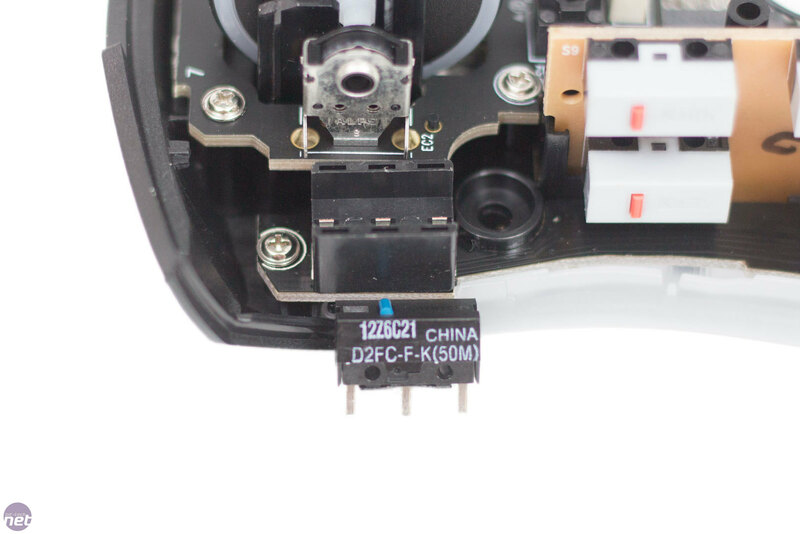 As you can see, the main button switches actually say 'China' on them. 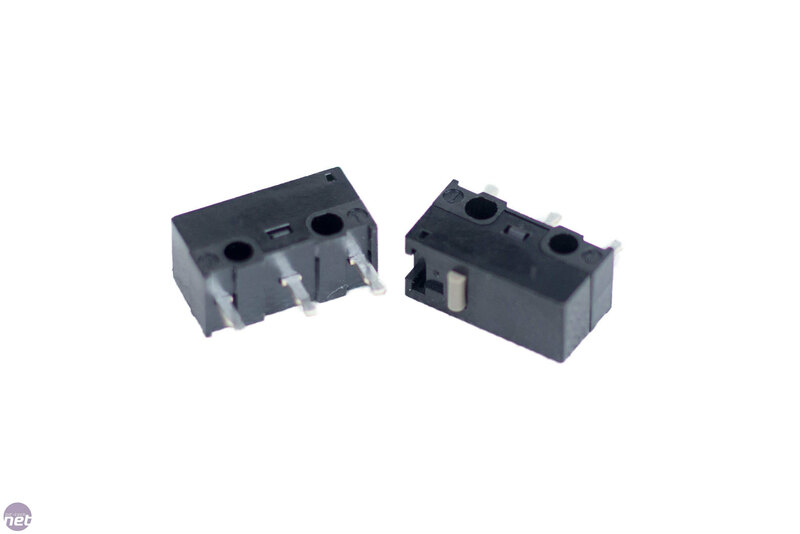 Usually, these use lower quality materials than the Japanese Omron switches but also have a much higher click rating. In this case, the Chinese switches have a 50 million click rating. As with all Omron switch ratings, though, this is without any weight. 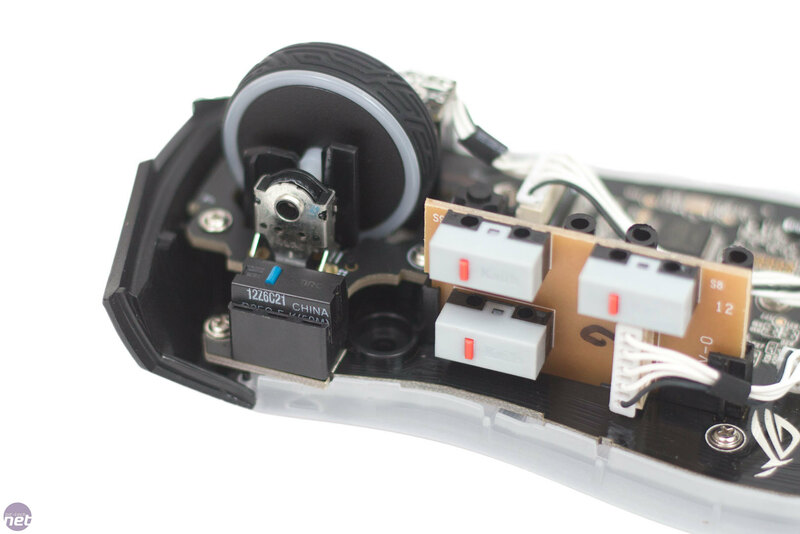 To remove the switch, simply pull on it; they aren't soldered in at all and it is very user-friendly. To put in new switches, simply reverse the process. RGB lighting isn't something that's actually needed, but when it is done well it can look pretty amazing. I will be honest and say this image is from Asus; I couldn't get a picture that really showed off how well the RGB lighting looked, and even this one doesn't do it justice in my opinion. There are three different sectors where you can see the LEDs. 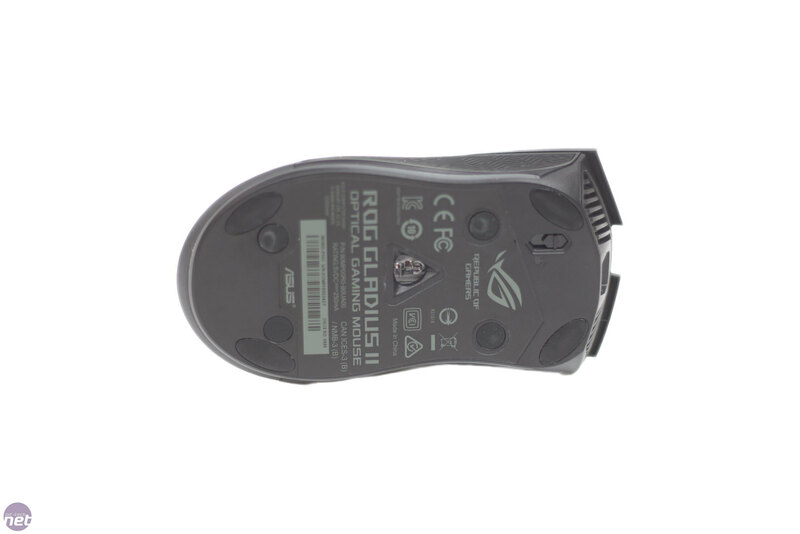 One is on the mouse wheel, one on the ROG logo, and the final area is around the bottom of the mouse. 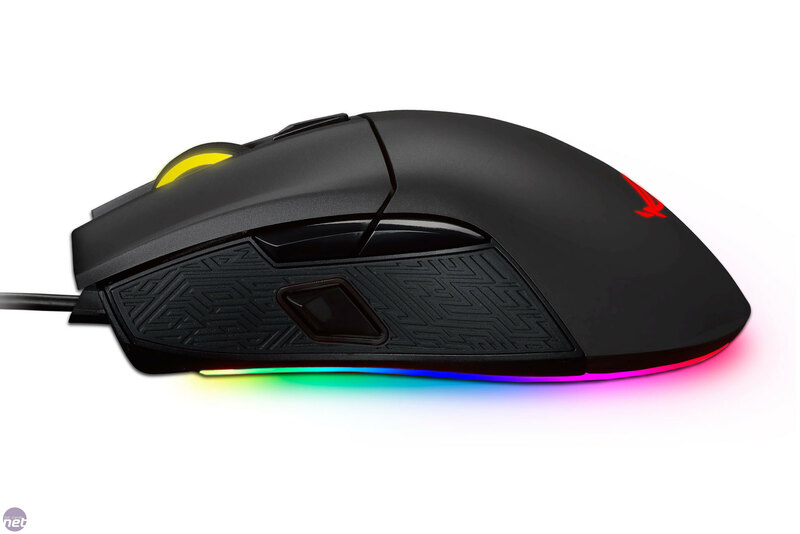 This is one of the best lighting options we have seen, as the glow seems to bounce off your mouse mat. I can personally live without RGB, but I must admit I did play around with this for a while. Obviously if RGB LEDs are not your thing, you can turn off the LEDs or set them to a single colour.